The defined income portfolio is engineered to cost-effectively protect principal and reduce exposure to rising interest rates while precisely matching fixed income securities to spending needs or finding advantageous spots along the yield curve. We understand that each account may have unique cash flow needs. Given this, we enable you to tell us when an account needs cash, how much cash is needed and what fixed income securities should be used to generate the cash flow needs. Unlike most annuities and bond ladders, we give you the flexibility to easily implement a variable income portfolio at the account-level while providing the ability to adjust the portfolio as a client’s situation changes. 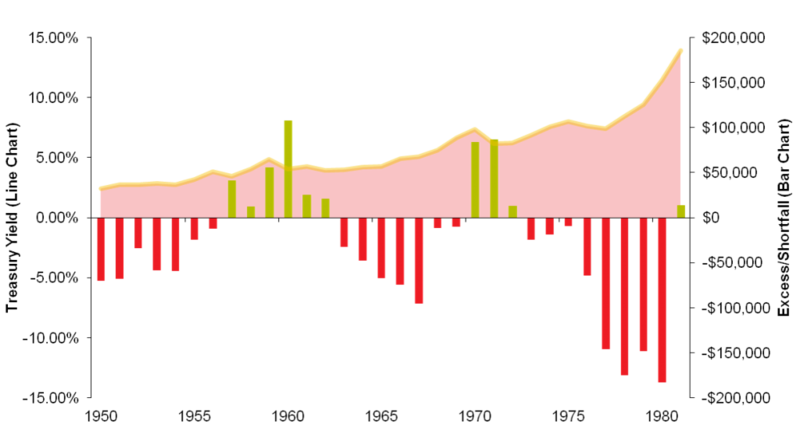 When interest rates rise, bond funds typically have to sell performing bonds to fund outflows from the fund. Since interest rates are at historically depressed levels, we hold individual fixed income securities and fixed maturity ETFs to maturity so that we can mitigate rising interest rate risks. For anyone that relies on fixed income investments for their spending needs, protecting principal is essential. Knowing this, we hold investment-grade individual bonds, CDs or fixed maturity ETFs to maturity so that the client can effectively lock-in their principal while generating yield along the way. 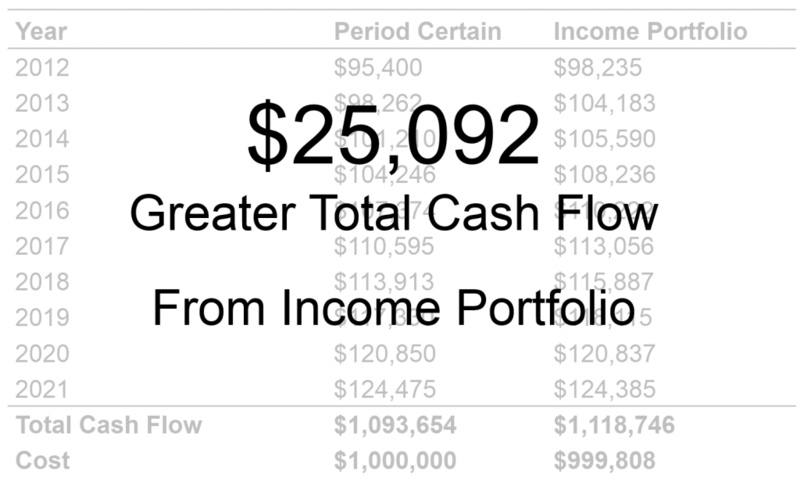 As you can see in the example below, we can customize each client’s income portfolio to accurately match their account-specific cash flow needs. Since we use individual bonds or fixed maturity ETFs instead of annuities, the client can make a changes to their income as needed without having to worry about surrender charges. Individual – Municipal bonds that generate eight years of cash flow needs ($100k/year plus 3% inflation) plus $50k in year six for a new car. In the chart, you can see how bond funds have performed relative to bonds held to maturity during the last rising interest rate period between 1950-1981. Through our experiences and research, we found that predictable, flexible, and cost-efficient fixed income portfolios typically provide clients with an improved chance of achieving their financial planning objectives. Given this, we analyzed various types of income producing securities before deciding to build portfolios with investment grade individual bonds and fixed maturity ETFs. As we began our research, we identified various questions we wanted to answer about various fixed income investment vehicles. By asking these questions about each investment vehicle, we were able to find out the pros and cons of each investment vehicle. How predictable is the investment vehicle? Is the investment vehicle flexible? Is the investment vehicle expensive for what it delivers? What happens to the investment vehicle when interest rates rise or fall? Does duration negatively or positively impact an investor in a rising interest rate environment? Does the investment vehicle yield enough? Does waiting in cash in an rising interest rate environment make sense? Is it easy to purchase the investment vehicle? Through our research, we found that bond funds face significant pressure in rising interest rate environments because the fund managers have to sell performing bonds to fund the outflows. In the chart below, you can see how bond funds performed relative to bonds held to maturity during the rising interest rate period between 1950-1981. In order to avoid this conundrum, many bond funds shorten the duration of their funds and/or incorporate derivatives to reduce volatility and hedge against rising interest rates. Doing so, bond funds may end up sacrificing the yield captured from longer bonds, making investments based on interest rate movement predictions and buying riskier bonds while increasing the administrative costs necessary to manage the fund. Given these cons of bond funds, we found that clients would not be best served by not investing in bond funds during a rising interest rate environment. When we looked at annuities, we found that annuities were priced out with the expectation that the client would live to 120. In addition, we noticed that they charged surrender fees if the client needed to get out of the contract even when the clients financial situation had changed. Lastly, we found that the way annuities companies present returns is not transparent because the principal payback is listed as a part of the return. Given all of these reasons, we found that they were typically too rigid, expensive and non-transparent to be worth investing in. When interest rates rise, bond funds face pressure because the fund managers have to sell performing bonds to fund the outflows. In the chart, you can see how bond funds have performed relative to bonds held to maturity during the last rising interest rate period between 1950-1981. If an annuity matched the cost, flexibility and risk profile of a portfolio built with investment grade fixed income securities, we would use it. However, many annuities have surrender values and more than 60 life insurance companies offering annuities became insolvent or came under the control of the state insurance guarantee system since 1991. In this video, Professor Huxley and Steven Huxley sit down with the American College to dig into the research behind the defined income portfolio. Enjoy! Since the way a portfolio is implemented and maintained can have a significant long-term impact on returns, we established the best practices below. When possible, we utilize the tax efficient version of the desired fund so that your client can reduce their tax liability. We incorporate your clients legacy positions into our model until you and the client are ready to strategically realize the gains. For each fund that we use, we found the most highly correlated no transaction fee fund at Schwab, Fidelity and TD. After that, we compared the expense ratios, transaction fees, geographic deviations and asset class deviations to calculate a minimum trade thresholds for every security at each custodian. Doing so, we are able to put smaller contributions to work without the unnecessary transaction fees. Every day, we monitor your clients’ fixed income securities for changes in credit quality and notify you with a recommendation. We monitor the cash levels in each account and either notify you or invest/raise cash according to the settings defined in the investment policy statement. We understand that the cost of rebalancing may outweigh the benefit of doing so. Given this, we utilize tolerance bands minimum trade thresholds for each security. When locating assets, we place less tax-efficient assets, such as bonds, in tax-deferred retirement accounts and more tax-efficient assets, such as stocks, in taxable accounts. As many studies have shown, this practice can significantly reduce your an investor’s tax liability. Since our average portfolio’s expense ratio is .28% and our fixed income portfolios have no fund fees, your client can invest significantly more than the industry standard. With access to more than a quarter of the US retail bond market and our proprietary models, we can build portfolios with agencies, CDs, municipal bonds, corporate bonds, TIPS or fixed maturity ETFs. Using lessons from the pension world, we engineer portfolios to deliver the cash flows your client desires. 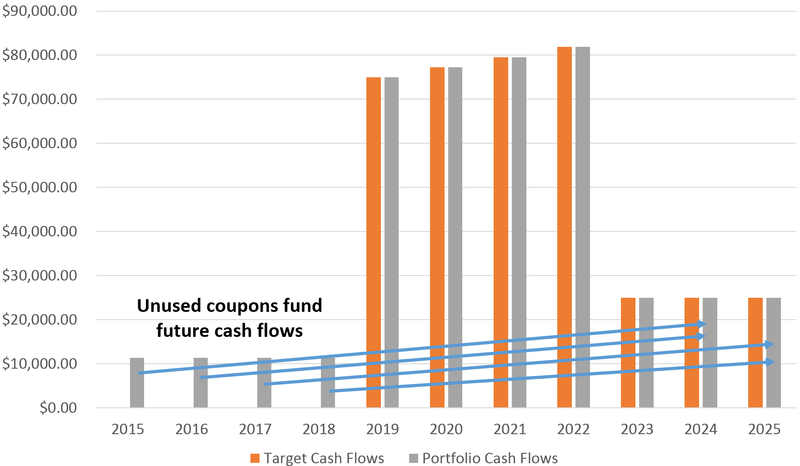 For clients in retirement, we look at their projected lifetime cash flows and current account balances to back into a portfolio that has been historically sustainable. By approaching the composition of the portfolio with this liability-driven approach, we seek to better balance the risk and return profile in the context of the clients future financial goals.